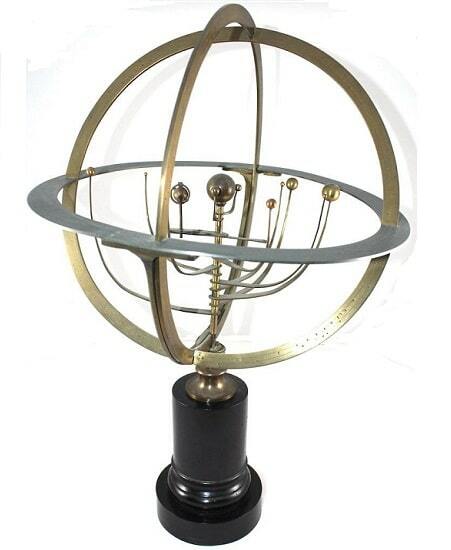 A Ptolemaic Armillary sphere by Delamarche C.1780. 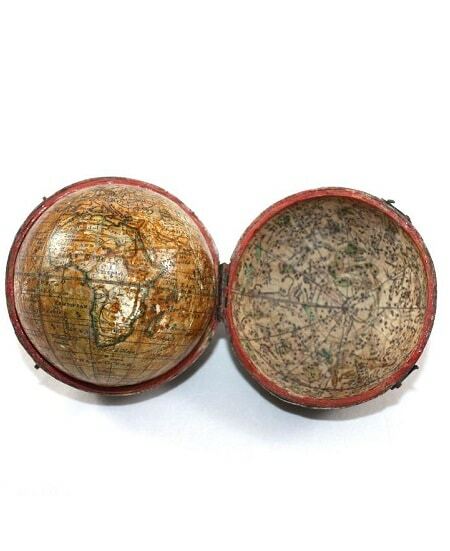 Terrestrial globe composed by twelve hand-colored engraved gores and mounted at the south pole. Zodiac circle with coloured printed paper. Polar, tropical, equatorial and hours rings, the meridien circle printed with hour scale, the horizon ring printed with figures and names for the houses the zodiac, graduated in days and showing the names of the months and compass points, supported by four quadrants showing latitude and longitude for various cities, mounted on a turned plinth base. 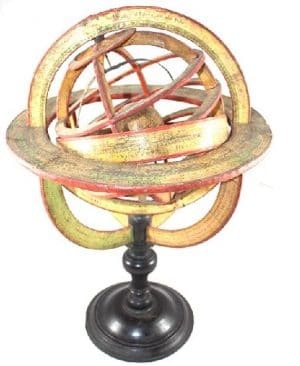 The terrestrial globe features a twelve hand-colored engraved gores and mounted at the south pole. Zodiac circle with coloured printed paper; polar, tropical, equatorial and hours rings, the meridian circle printed with hour scale, the horizon ring printed with figures and names for the houses the zodiac, graduated in days and showing the names of the months and compass points, supported by four quadrants showing latitude and longitude for various cities, mounted on a turned plinth base. The primary sphere consist of eight cardboard rings, with red painted rims and covered with printed paper. Two rings are fixed perpendicularly to each other and represent the colures. They are graduate from North 90·-0· ; 0·-90·, numbered every 10· , division 2· There are labelled Colures des Equinoxes and Colures des solstices. Five parallel rigs are fixed perpendicularly to the colures and represent the polar circle , the tropics , and the equator. In the center , there is a terrestrial globe mounted on an equatorial axis attached to the south equatorial pole.